The report describes lifting operations that were performed on a research vessel and on the basis of a single observation, but the operation fell short of the minimum expectations under SI 2006 No.2184. The Merchant Shipping and Fishing Vessels (Lifting Operations and Lifting Equipment) regulations 2006. 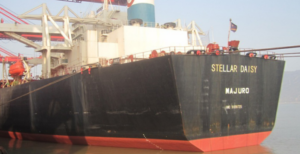 Namely, the deficiencies identified could have caused serious harm to the vessel’s crew, third parties and/or pedestrians. Specifically, four oil drums were lifted unsecured on a wooden pallet using web strops. During the lifting operation the wooden pallet, which had not been designed for this purpose, started to break up. The area had not been cleared and the load passed over the single gangway access to the ship which was not secure. 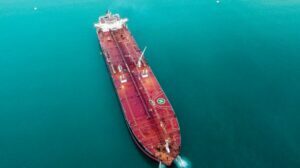 The vessel operator reacted in a positive way, and conducted an investigation that identified failings against their SMS. Since then, they have added more equipment which, if used correctly, should make sure that similar operations are performed safely in the future. 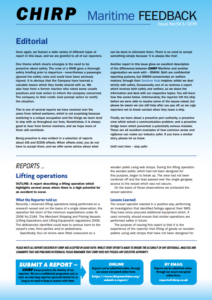 Regarding Near Miss reports, the lifting incidents received by CHIRP and other organisations such as IMCA and the Marine Safety Forum (MSF), are almost completely associated with routine lifting operations. More specifically, problems have not been associated with a lifting plan itself, but with how it has been performed. What is more, the organizations rarely receive reports about heavy lifts or complex operations, with CHIRP identifying 'routine' as the key word. In addition, the above incident led to a series of failures of the Swiss Cheese model, meaning that each problem could have led to an injury. Namely, the first part states that oil drums were lifted unsecured on a wooden pallet using web strops. That is three defences breached. During the lifting operation the wooden pallet, which was not fit for this purpose, started to break up. 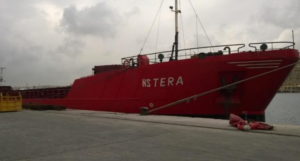 Moreover, the area had not been cleared and the load passed over the single gangway access to the vessel which was not secure. A risk assessment should be able to limit poor seamanship practices, incorrect lifting techniques and incorrect apparatus used for lifting. Training should also be taken into account, CHIRP notes, as it is as important that the location of the lifting is considered. 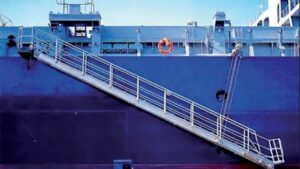 In this case the load passed over a gangway and the results of anybody boarding as the load fails could have been very serious.